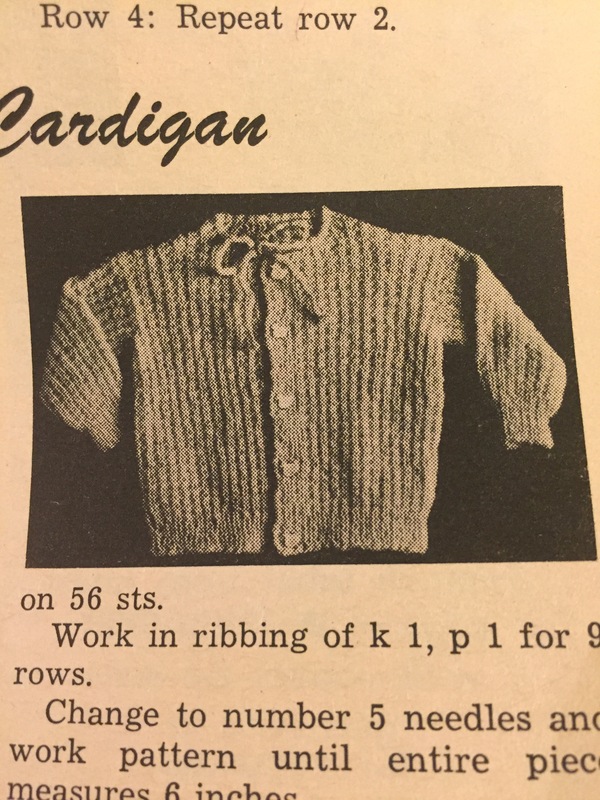 This month’s issue, January 1967, didn’t have a ton of projects I was dedicated to make, but one of the ones I did decide to do was this adorable baby sweater. Here is a little fact I may have mentioned before, I’m not a sweater maker. 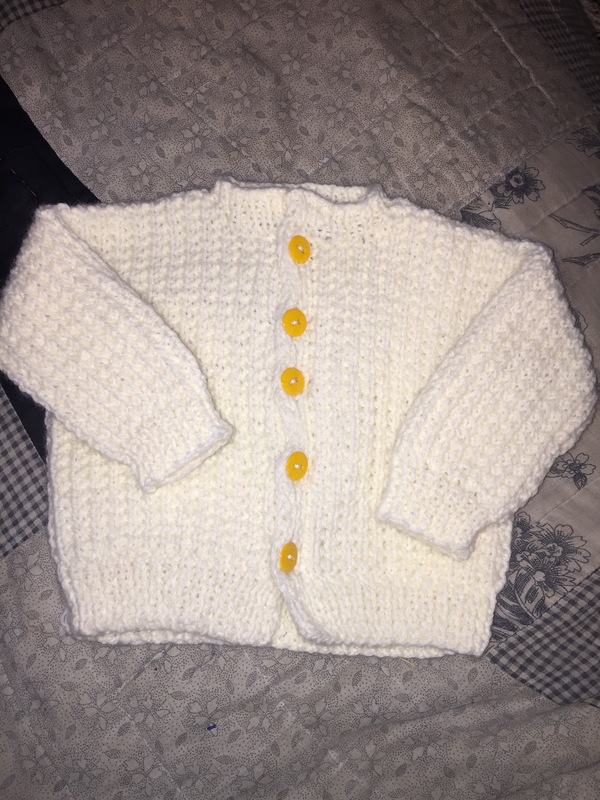 I’ve only ever made, and finished, three sweaters before in my life. I also kinda made a vest. But I really wanted to make this sweater. It had a stitch pattern which adds to my chance of completion, and it is small, which increases my chances even more. And with this skein it happened, and happened, and happened. Just over and over again. 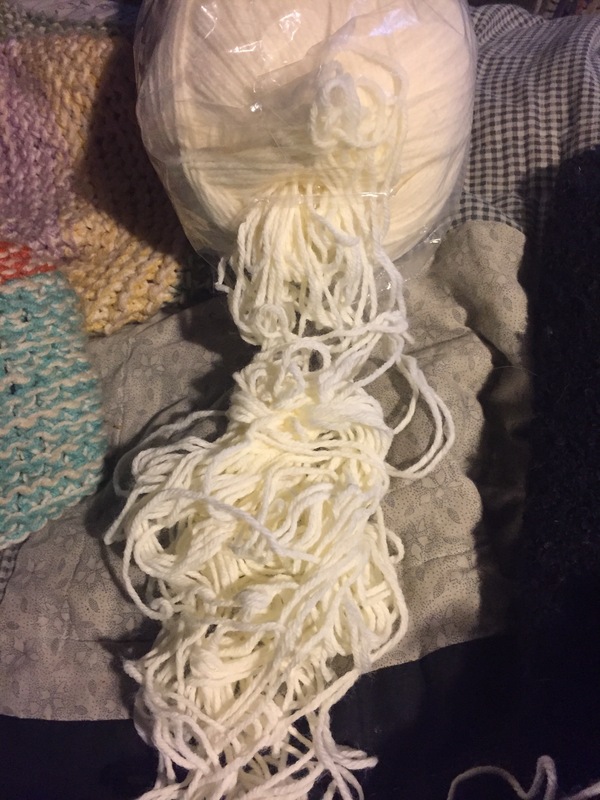 I couldn’t believe with such a popular, basic yarn that it would happen SO much. I started this sweater last weekend, worked on it a little at a time while watching TV and such, and finished it this weekend! It totally looks like a sweater! Accomplishment!! The instructions were all very easy to follow. The stitch pattern was easy but kept it from being tedious, was easy to memorize, and created a really cute pattern. I accidentally messed up the button holes, forgot to start them in the ribbing in the bottom, so I just started them above the ribbing and spaced them evenly. The sleeves were also very easy. The sleeves were so easy in fact that I managed to knit one with two 9 year old boys in the same room, with both the computer and tv going in addition to the usual racket two 9 year olds make! After the main sweater was done I had one tiny problem with the neckline. 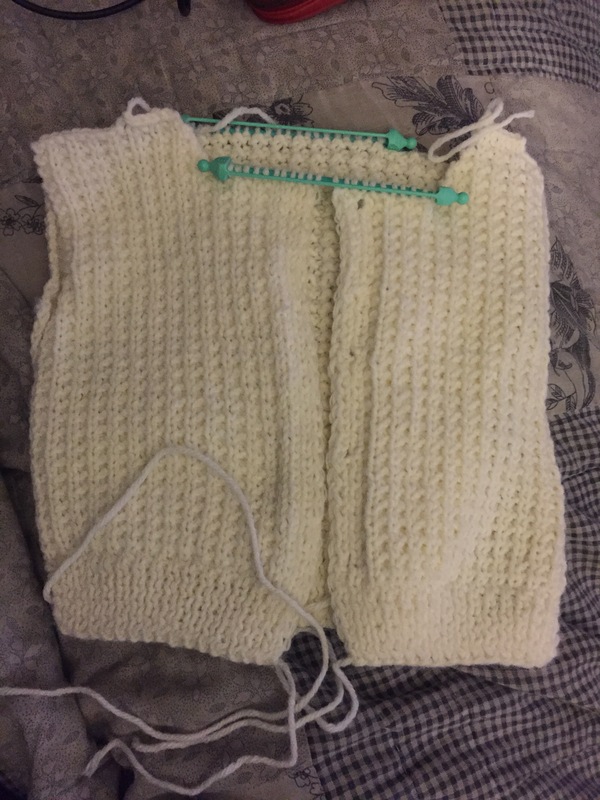 The pattern said to pick up four stitches on each side, and despite all my numbers being right so far, four just wasn’t enough. I needed to pick up six stitches to not have glaring holes. That was the only time in the whole sweater that anything didn’t work exactly as the pattern said. I have to say, my seams were awesome! I’m not always great at sewing up seams on knit items, but I stood up and cheered after completing this! Here’s to practice!! It came out adorable! Like a little man sweater, that would also look great on a girl. Just so stinking cute. Makes me wish I was keeping it. I added yellow round buttons instead of the ducks the pattern called for, and I sewed in a little “hand made” label. Sonce drawstrings are avoided on kids clothes these days I didn’t add it, and it really isn’t needed. I feel like this is a great example of why I love the Workbasket. The patterns are just so timeless. This is a 50 year old pattern that still can be made today. Some magazines had such fads that the only real value is laughs, but not the Workbasket! I’m very proud of this sweater. 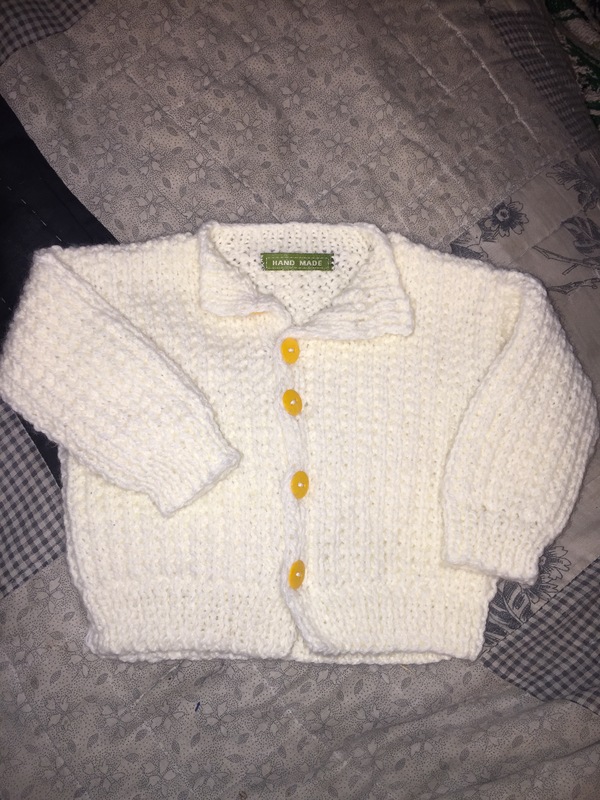 I really feel like if you picked it up you would think it was from a fancy baby store, and not handmade with stashed mass market acrylic yarn. The time it took to make was great too! You could start upon receiving a baby shower invitation and have it done in time for the shower! 2. Knit one purl one across row. The back side creates a gentle nubby fabric that would be great for washclothes and dishclothes. Or two layers thick would be a great hot pad! And now that this sweater is done I’m already on to the next project! Crochet hook in hand and working on a hot pad! Wow, that is a very nice looking sweater and the yarn looks good too. I wish I had that pattern. Unfortunately, I don’t have that issue. The sweater is darling. The stitch is known as a Shaker rib. It probably has other names as well, like most knitting stitches do.